After about a week of hardening off the tomatoes and eggplants they're finally in their permanent homes in the rooftop container vegetable garden. The celebrity tomatoes are in a Garden Patch Grow Box. This self-watering container is similar to the Earthbox, it has a 4 gallon reservoir so you can go a little bit longer between waterings (the Earthbox has a 3 gallon reservoir). 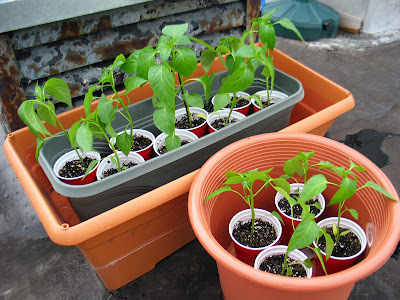 The cherry tomato and the eggplants are in 16" pots from Home Depot with 1 gallon self-watering conversion kits from gardeners.com. Snow peas are in the 12" inch self watering container on the left. I hope they all adapt well to their new environment. It can get very windy up here, none of the adjacent buildings are taller than mine, as a result there is nothing around to act as a windbreak. I might have to go overboard with plant supports. I am so glad to be following you wih this. It will help me decide what to plant next year as to what will do well in a pot. Though I do think I will be creating a small raised bed at the beginning of next spring. Everything looks wonderful! I sowed my tomatoes late and they are just starting to get their true leaves. I'll be potting them up this weekend. I sowed Eggplant for the first time too... late as well, but they are just about ready to harden off. ...just wondering... when did you sow the tomatoes? They look so large. Great job! I sowed mine about 3 weeks ago, which is probably a bit later than I wanted and they are just starting to get their true leaves. I sowed eggplant on 3/31 and that are still small too, but farther alone than the tomatoes and ready to harden off. I've never done this before so I'm learning. Hi Jackie, NYC's average last frost date was mid April so I sowed all my seeds at the at the beginning of March. I could have transplanted the tomatoes 2 weeks ago, but I didn't want to risk a cold snap. I wouldn't rush to transplant the eggplant, they cam be fussy and react poorly to cool weather. I waited till mine were 8 weeks old before I put them out. Johnny Boy I truly think those are the same red cups from way back when you used to live in NY. How does the GrowBox work out compared with the Earthbox? Any comments on the self water conversion kits? Hi William, I don't have an Earthbox so I can't compare, but I'm happy with the GrowBox's performance. 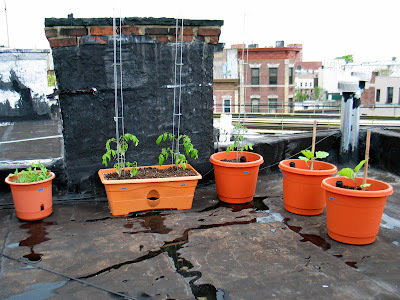 The self watering conversion kits are fine as long as you grow the appropriate plant. Plants that need a lot of water to thrive are better suited to a GrowBox or Earthbox.